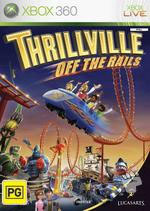 Thrillville Off the Rails is the latest and greatest title from Lucasarts that allows gamers to not only manage their own theme parks but also walk through their worlds and experience the excitement from going on rides, talking to customers and ensuring that their customers are happy from the moment they enter to the last moment they leave. With that said, the possibilities of Thrillville is almost endless, however in the end, your theme park needs to make money which can purchase additional rides, stalls and ensure that the staff perform their jobs. Before starting the game, players must create their own Thrillville avatar which is basically selecting a pre-created character and then tweaking them to your own liking. Although the title contains a plethora of mini-games such as cleaning up vomit, challenging customers to games or even making friends with customers (ala The Sims), your character is also given benchmarks and once these are met, your character can then progress to next stage of the title. As the park manager, you walk the parks taking a first hand look at the goings-on. As mundane as some of the tasks seem, Thrillville does a good job of keeping it simple and fun. For example, if your guests are complaining about park cleanliness or broken down rides, you know that it's time to hire and/or train your staff. Training staff involves a mini-game, specific to their function. If your park is getting dirty, you play a mini-game helping your staff member wash away vomit and vacuum up trash. The better you do, the more efficient he becomes. There are mini-games for ride maintenance and entertainment as well, with puzzle and rhythm elements. If your customers are bored, then it's time to add some thrills to the park, by building games, rides, or roller coasters. The game makes it easy to know what your customers need, through comments you hear as you walk past, conversations you can engage in with customers, or through the stat-tracking elements detailing your park's performance. The relationships you develop with your customers are also an integral part of Thrillville. The dialogue takes place through conversation trees. Picking the right responses will help you accomplish a mission. Or, you can challenge a patron to one of the games in the park. You can choose to make park-goers your friends, and attempt to flirt with them, or find romance for them with another one of your buddies. It's a bit juvenile, but an interesting diversion to running the park. The building of rides, games, and stalls basically consists of selecting from a menu of choices, and making sure you have enough, space, power, and cash to build it. As you spend time and money in research, or attain various "mogul" levels, more rides and games become available. The exceptions are roller coasters. You won't have the ability to construct mammoth coasters, but you can get pretty creative with hills, turns, banked turns, loops, and so forth in the space you have to work with. You can also add "whoa" effects, like having the coaster explode through a faux brick wall, or having a giant claw pick up the car and move it from one track to another. There's no way any of those effects would be available in a real park, but the fringe physics makes playing "coaster creator" beyond the limits of safety and science fairly fun. There are also some handy assists to help you complete the coaster, or to speed up the process. Or, if you'd rather, there are some pre-built coasters you can purchase to save time. You can play at your own pace without many negative consequences. Quite honestly, it's difficult to fail at managing a park. You need cash to build rides and stalls, hire staff, research new technologies, and to invest in marketing. However, everything is pretty profitable, and over time, you earn money at a pretty good clip. You can even take a loan if you're desperate, but it's really not necessary. Anything can be sold to make money, or to make room for a new ride, game, or stall. Even if you don't do much, things will operate pretty smoothly, although it will obviously take you longer to unlock the next park to manage in Thrillville. This gives you the opportunity to not only manage your park, but have some fun in it as well. You can ride every ride and play every game in the park, along with building relationships with your customers. The game doesn't punish you for playing it your way, which gives you some freedom just to explore every nook and cranny of your budding empire. There are some limited Xbox Live options, like rankings boards and the ability to share coasters. However, the rankings boards only show the top 10, and you can only share coasters with those on your Xbox Live Friends list. Finally, other playing options include the ability to jump right into coaster building, or to play any of the 50 arcade and carnival games that you can build in your parks. The carnival and arcade games have an old-school arcade feel, albeit with updated graphics. It would be fun to be able to play those mini-games online, but that option is not available. The look and sound of the game has an authentic amusement park feel. The graphics are cartoon-like, but sharp and colorful. You do have some basic customization options for your main character's appearance, and for either painting or "tricking out" (applying a pre-designed theme) the rides, games, and stalls you build. The animations are pretty smooth, although the camera can be a bit wonky, making it somewhat easy to lose your avatar in a tunnel, or behind a building, or something similar. It's easily correctable with the right-stick, though. Amusement park ambient sounds abound, drawing you into the environment. There's also a rockin' kid-centric soundtrack, adding to the fun atmosphere. In conclusion, although there is a lot to do in Thrillville, it is really designed for the pre-teen crowd. It's pretty easy to successfully manage a park, the missions aren't challenging, the carnival games and arcade games are simplistic, and the options for building rides and coasters are limited. Roller Coaster Tycoon this is not. That said, for kids, or as a game for family play, Thrillville definitely provides enough excitement and innocent fun to warrant a purchase.